Inside: Spring cleaning in one day is possible by following these guidelines. 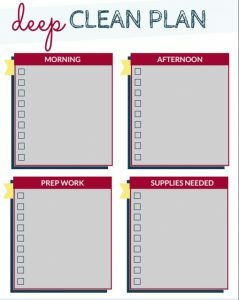 Download your free printable of common spring cleaning tasks and create your agenda to deep clean in one day. I hate cleaning but I also have a high dust allergy. So bad in fact allergy shots alone don’t keep it under control. So a deep clean, along with regular cleaning, is a must for me. Whether you receive satisfaction from a day of spring cleaning or dread it as much as me, I’m guessing spring cleaning your house in one day is appealing. 1. Decide what chores need to be done ahead of time. What areas of your house are neglected during your normal weekly or monthly cleaning? Spring cleaning isn’t the time to also squeeze in your normal chores like mopping the floor or folding a load of laundry. If you combine your spring cleaning day with other chores, you won’t accomplish very much. 2. Layout a logical sequence of events. This will prevent you from running from one side of the house to the other. Take into consideration the time some chores take over others. For example, if you’re planning on cleaning your oven, you’ll want to start the night before. Or the dishwasher can be started in the morning on the first cycle while you clean other areas. Additionally, when you lay out your plan don’t leave the most dreaded chore for the last one of the day or you’re likely to skip it. Give yourself small wins throughout the day to keep yourself going. 3. When you’re deciding which areas you’ll spring clean make sure you have all the supplies you need before the day begins so you aren’t distracted and need to leave for the store halfway through. If you’re anything like me, you’d talk yourself into quitting by the time you returned. spring cleaning in one day: you can do this! Here’s a list of common spring cleaning chores that many of us don’t get during our monthly or weekly cleaning. Chances are, you don’t need to do all of these listed and there may be a few you need to add. Download the printable at the bottom of this post and personalize your spring clean in one-day agenda. Get your free spring cleaning printable and schedule below. Clean Oven – Although you can use your oven’s self-clean function if it has it, many do not recommend it anymore due to the toxicity involved. Making a baking soda paste is a popular, easy, and environmentally friendly option. Your oven will need to sit with the paste for 12 hours or overnight so remember to begin this chore the night before. Clean inside of the dishwasher – Cleaning the inside of your dishwasher is as easy as running a cycle with vinegar and baking soda on two separate cycles. You simply need to plan this during the day as you do your other chores. After a winter spent indoors, chances are your yard is ready for some TLC. Clean a/c unit outside – Right before the new season is the best time to clean out your outside air conditioning unit. Remove all the leaves and accumulation during the fall and winter around your unit so it performs at its best in the upcoming summer. It’s not spring cleaning without dusting, unfortunately. 4 Surprisingly Easy Ways to Keep Clothes Closets Mess Free – These tips work amazingly well on kids’ closets and help you to implement an ongoing declutter strategy for your clothing. How to Get Control of Desk Clutter Once and For All – Check out these clipboards that organize your incoming mail and important papers so you’ll no longer have paper laying on your desk in piles. 9 ways that will simplify decluttering so you can get on with life – Ways to clear the clutter in your home when you hate cleaning. 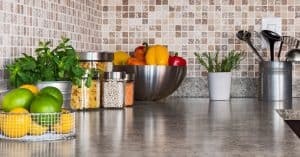 11 kitchen organization tips you will want immediately – These kitchen organization tips work for even the smallest kitchen and make your kitchen work for you instead of the other way around. 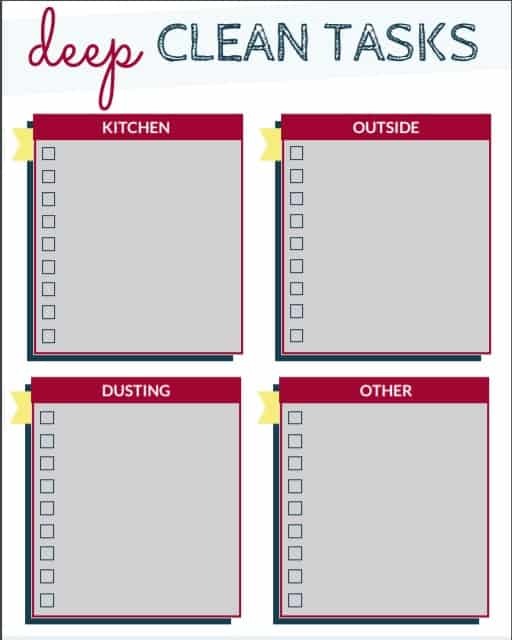 In the resource library, you can download a 2-page freebie to plan out your spring cleaning. There’s a page to plan out what chores need to be completed by room, make sure to use this post as a guide. Then a page to plan out what you’ll accomplish when as well as what supplies you’ll need. 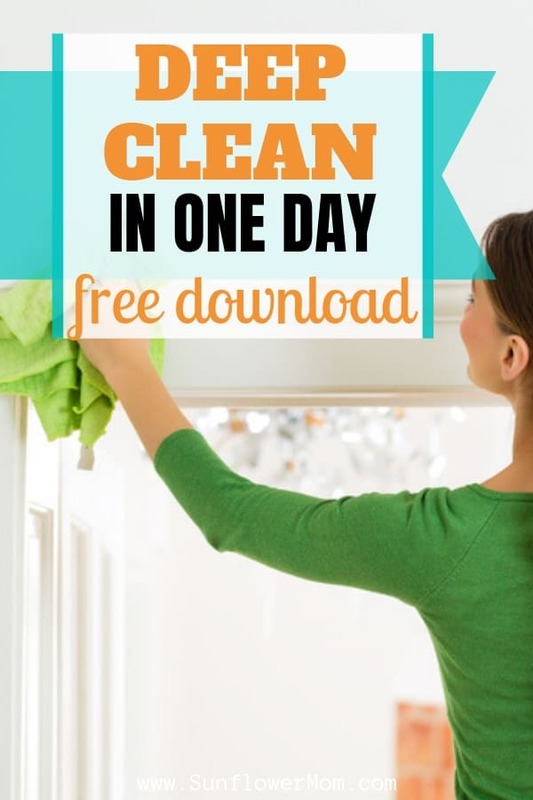 Grab it for free from the resource library and complete your spring cleaning in one day flat! Spring cleaning in one day is possible by following these guidelines. Download your free printable of common spring cleaning tasks and create your agenda to deep clean in one day.